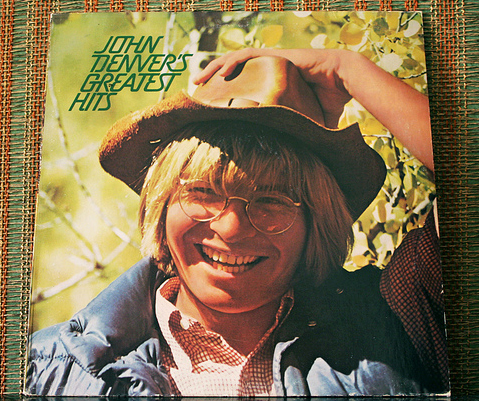 John Denver Greatest Hits album cover photo by Jeremy Chan on Flickr (noncommercial use permitted with attribution / no derivative works). "...Few celebrities have been as closely identified with any single place as John Denver was linked to Colorado ... In his song lyrics, he evoked the image of a landscape and a lifestyle; snowcapped peaks, sun-drenched meadows, blue jeans and a certain freedom that city dwellers could only yearn for..."
Another John Denver song: Take Me Home, Country Roads (opening with "Almost heaven, West Virginia...") was adopted as an official state song of West Virginia in 2014. Colorado Senator Bob Hagedorn (who pushed for Rocky Mountain High as the second state song) said: "Even if John Denver thought West Virginia was almost heaven, he chose Colorado to live." Lyrics to "Rocky Mountain High"
you might say he found a key to ev'ry door. on the road and hangin' by a song. it keeps changin' fast and it don't last for long. I've seen it rainin' fire in the sky. is softer than a lullaby. Rocky mountain high in Colorado. and he lost a friend but kept his memory. of a simple thing he cannot comprehend. more scars upon the land. if he never saw an eagle fly.